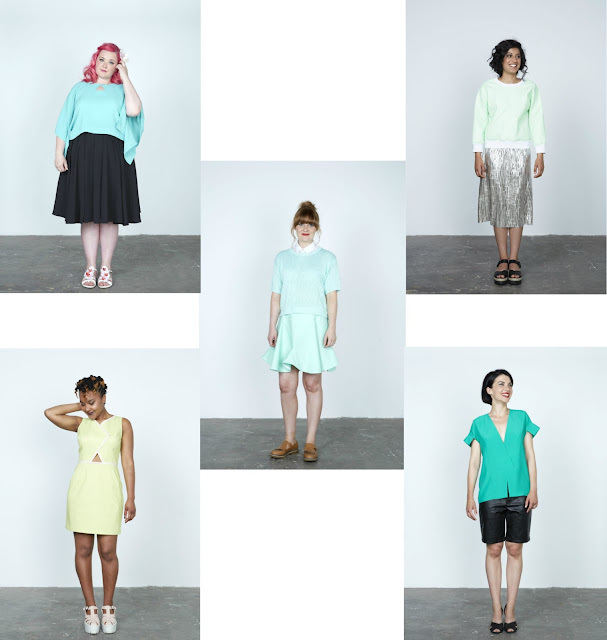 The last five designs in 'No Patterns Needed' are all defined by the triangle. When I suggested to Laurence King's commissioning editor that I create sewing tutorials based on the simplest geometric shapes, I already had ideas for designs that employed rectangles and circles, but the triangle was just a notion... a looming gap of actual plans. I said I would do it though, so it had to be done! The triangle is an exciting shape. It seems intrinsically bound up with the two other shapes in the book. Cut a square or rectangle in half and you create a triangle. Divide a circle into segments and they are triangle shaped. 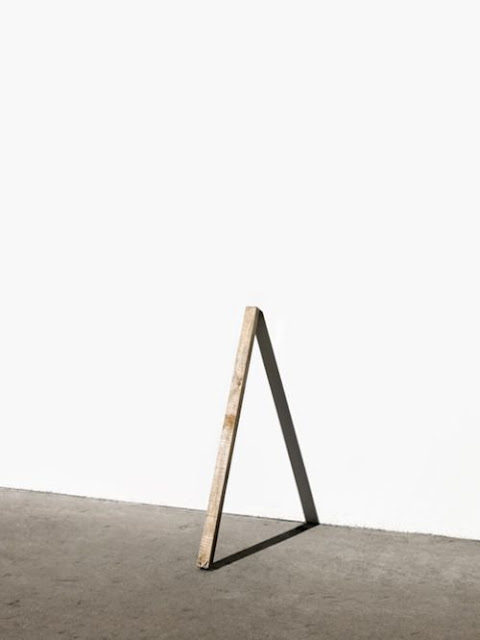 The triangle has the stability of the rectangle – it can rest on a flat side – and some of the dynamic properties of the circle – it points upwards and appears to be able to take off like a spacecraft. Triangles seem to embody enormous structural strength. Buildings made with triangles have been known to survive earthquakes, hurricanes and tornadoes. 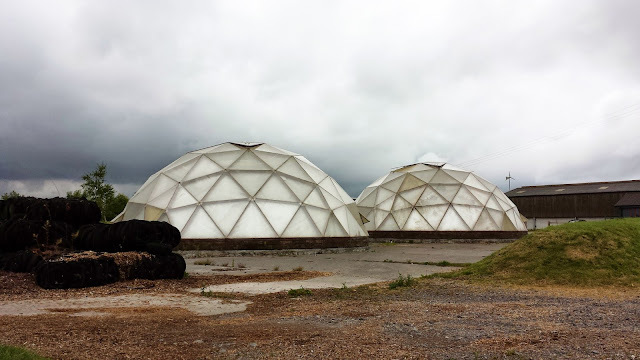 The geodesic dome is a half spherical structure made entirely of triangles that has been adopted to build anything from Olympic stadiums to off-the-grid personal dwellings designed to endure nuclear apocalypse. Here's a picture I took of Yeo Valley, the organic dairy farm, that houses some of its cows and equipment in these impressive triangle based domes near where I grew up. I can't help feeling they look a bit like they landed in Somerset from a galaxy far, far away. 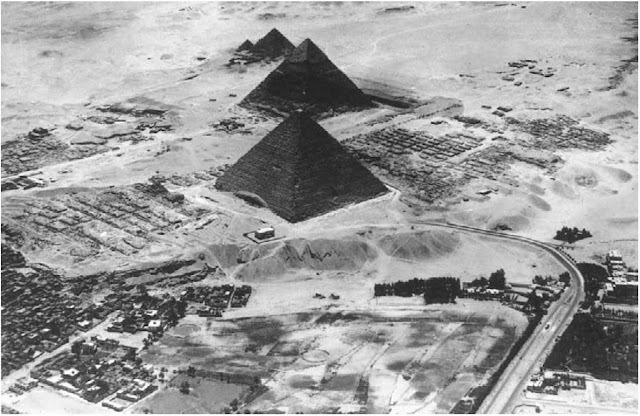 The greatest structures on earth to embrace the triangle must surely be the ancient Egyptian pyramids. Dominating the landscape, these massive stone monoliths have survived the weathers of four and a half thousand years. We know that the pyramids are surviving artefacts of an extremely complex society. Yet despite our knowledge, they are still steeped in mystery, representing a gap in total comprehension. We don't fully know how they were constructed and we doubt theories about the reason for their existence. That gap is filled with human projections. They are giant batteries that charged an ancient electric city. They are windows to space and were used to guide in alien spacecraft. They contain codes that fortell the destruction of planet earth. Though ancient, the pyramids seem to conjure up the spectre of the futuristic and otherworldly. Rather than a structure in and of themselves, they are described as a conduit, a gateway to step through, a window through which information can be received. This idea of absence seems ingrained within the triangle. From love triangles to the holy trinity, this pointy shape is often used to denote a space or situation that humans cannot master. The Bermuda triangle is thought to be a hole into which matter can literally disappear, never to be seen again. 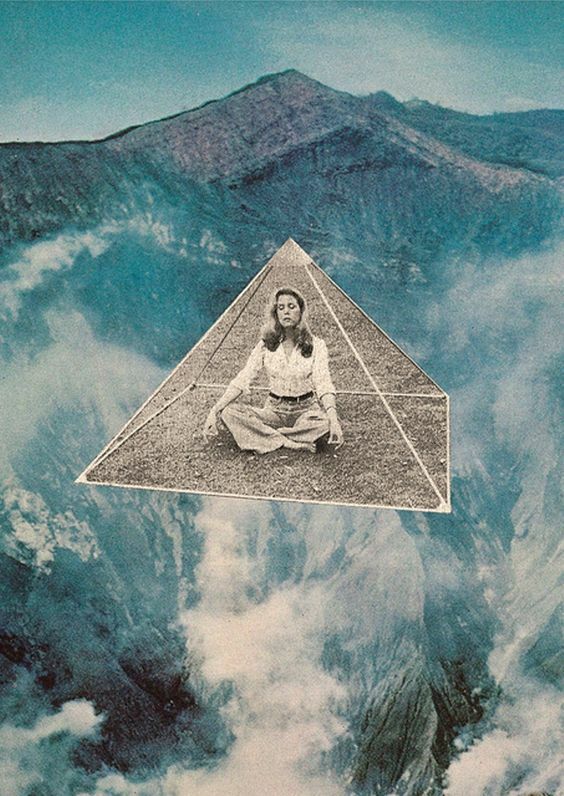 Triangles are employed in mystical symbolism, representing gateways to higher spiritual understanding or the irresistible door to other worlds or dimensions. ...or at least the illusion of negative space. I couldn't help but consider the sewing triangle par excellence – the dart. Darts are essentially triangular shaped chunks of fabric that are removed from a garment to make it fit the body. I started to think of darts as arrows that point towards the most sticky-out bits of the body. The dart is an extremely useful triangle when it comes to turning flat shapes into 3D ones. 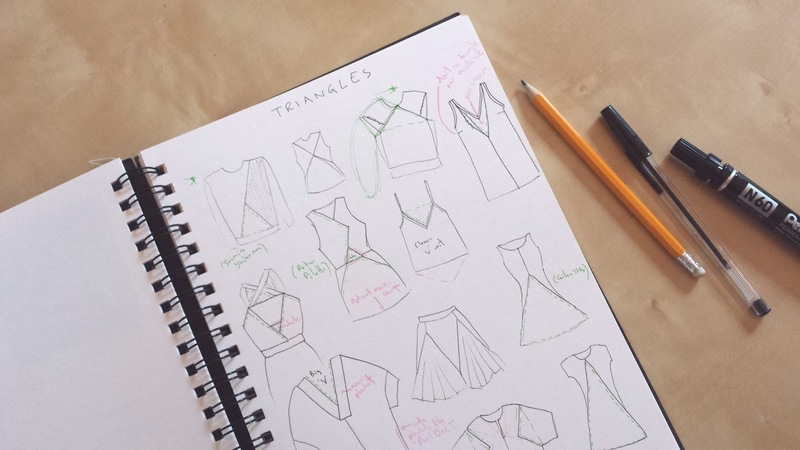 I sketched out a lot of ideas for garments that had triangles as a key principle. I really enjoyed working with the strength and power of this commanding shape. Some of the designs employed the positive power of the triangle, building clothes from triangular pieces of fabric and using it’s angular lines to create designs that verge on the futuristic. Here, Kristina wears a version of the 'Four Slice Sweater,' which has become hands down my favourite design in the book. 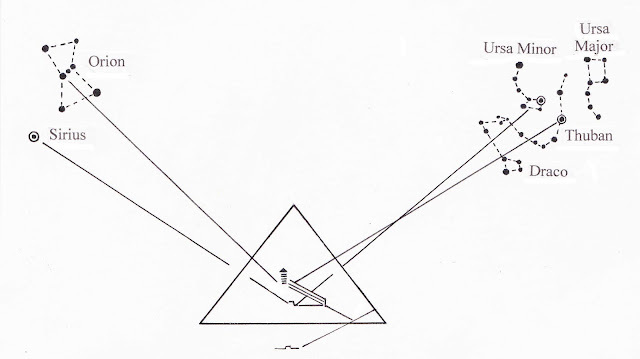 Other designs use the triangle as an absence, employing it to create negative space. 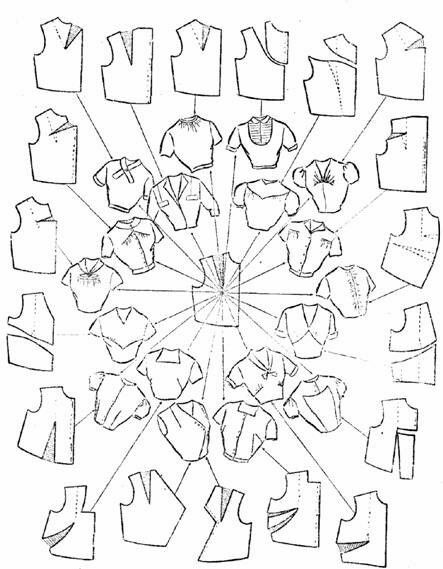 The 'Triple Triangle Dress' is the most involved tutorial in the book, employing three kinds of triangle - triangular shaped pieces of fabric, darts and a cut away at the waist - hence the name. For me, the triangle contains some unknown alchemy. I spoke it's name, and it appeared. 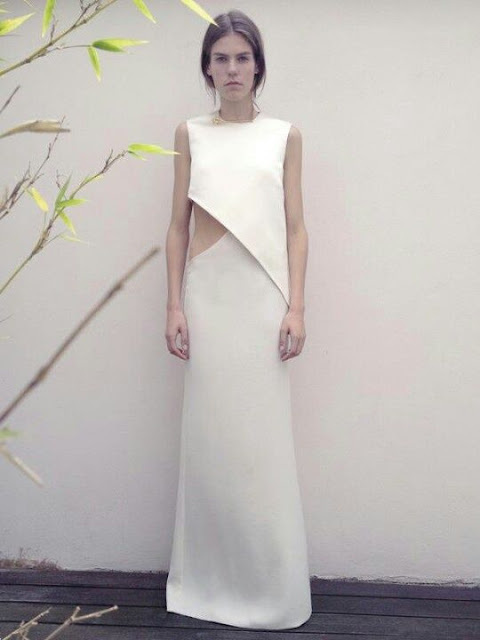 By focussing on it's powers, it enabled me to build the structures of five pieces of clothing. Thank you magic triangle. We are all magi when we sew clothes. We start with nothing, and from our imagination and our labour we build something practical - or impractical - that we step into and adopt as part of our everyday. I hope that my book encourages people to enjoy this humble magic. Will we ever understand the ancient, otherworldly triangle, standing strong but pointing outwards to realms unknown? Perhaps not, but we can wear it! These designs are my favorite out of all the shapes you've shared. You have really done a fantastic job exploring the concept of the triangle and coming up with some great designs. I'm so excited for the book! Oh Rosie, this is so great. I haven´t had a look on your blog for quite a bit as there wasn´t so much going on here anymore. And now I just came back checking and WHOA!!! here you go with a new book and all those inspirational posts. I´m definitely going to order that book. Do you know, if there is a chance I can get it in German any time soon? If not, I´ll be more than happy with the English version too. Good luck with your new book!! !